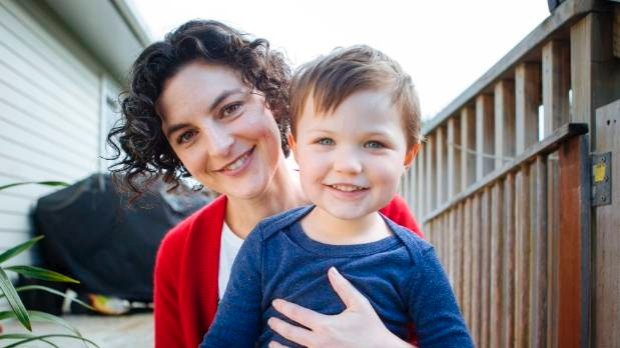 Auckland mum Catherine Woulfe battled infertility for two years before discovering a defect in her caesarean section scar was to blame. Woulfe started trying for a second child when her son was nearly two in September 2016. Should we start calling C-sections 'belly births'? After a miscarriage and months of negative pregnancy tests, she self-referred to a fertility specialist last summer. She took fertility drugs and had another miscarriage before starting the in-vitro fertilisation (IVF) process. That's when she discovered a little-known complication of caesarean sections was causing infertility in a small minority of women worldwide. The 35-year-old journalist has written a story about her experience on The Spinoff in a bid to raise awareness of the condition and told Stuff more about it. How did you find out that a caesarean section scar defect could be the cause of your fertility issues? I remember this so clearly. We were most of the way through our first IVF round, like a few days before egg collection. So I'd been doing the injections in the tummy every night for a couple of weeks. You get quite a few ultrasounds at that point to keep an eye on how the follicles are growing and work out when's going to be best to get the eggs out. Anyway we had one ultrasound where a specialist had seen fluid in my uterine cavity. She seemed kind of fine about it, just said they'd check again at the next scan. Then a couple of days later, same again. There was lots of concerned hmming from the doctors but no-one mentioned defects. I think all we talked about was just that we should plug away for this cycle, but freeze any embryos and not put them back in until we'd got rid of that fluid. We stopped for petrol on the way home from that scan and my husband was inside paying, and I Googled something like 'fluid uterus fertility', and all these pages and pages about caesarean scar defect came up. Like dozens of proper studies, and one really fantastic page for patients, from a fertility clinic in the States. I was like, yes. This is me. This is it. Holy s.... It just made so much sense to me. My main symptom was a classic defect one - that every time I ovulated, there was blood mixed in with the mucus that shows you're getting ready to ovulate. That was new for me since the C-section and I'd always thought it was weird. And we'd conceived our son right away and now nothing, nothing, nothing. I'd always had a feeling it was the C-section and I'd actually put that to a couple of doctors and they'd just brushed it off. We went home and I just went crazy on Google Scholar. I've done a lot of work for the Listener – lots of really research-intensive health stories – so I knew what to look for and how to read it, and was not shy at all about getting in touch with the experts overseas who seemed to be making most headway. That afternoon I emailed my specialist and demanded an MRI. I was pretty strident about it. He got me in for an ultrasound first and thought he saw a defect, and he agreed an MRI was the best next step. We had to wait a few days for the results and that was fairly anxiety-inducing. For a week or so over this time we didn't know whether we could actually get it fixed in New Zealand, because there was just no medical literature about it here and no information about it, nothing, so that was fairly hideous. I started looking at airfares for the States. How did you feel when you had confirmation you definitely had a defect that might have caused two miscarriages and two years of infertility? Elated. Exhilarated. Angry. Vindicated. Such a mess. The uncertainty had been the worst. The unexplained infertility. Having a diagnosis was a powerful thing. It's so hard to know what would have happened without the defect. Like we might still not have gotten pregnant. Or we might have had miscarriages anyway. I was all over the place. I had this really strong instinct to protect my son. I had this flash of knowing that if we couldn't fix this thing, I didn't ever want him to find out that his birth was the reason he didn't have a little brother or sister. Then when we realised we could probably fix it, I just wanted to tell the world. Tell all the women out there who were like me. 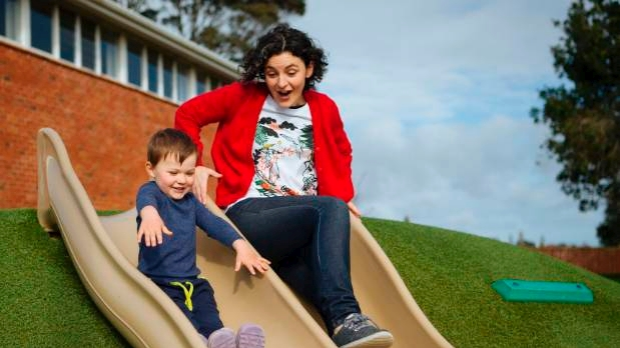 And I turned into this crazy person hitting up mums at kindy drop-offs and birthday parties and, oh my god, I even did it at a job interview. You talked to several international experts for the story - did you struggle to find local experts with knowledge of the condition? Is there a lack of awareness around it among local fertility specialists? That's my understanding. There's lack of awareness everywhere though. The US experts I talked to said it was the same there. Simon McDowell, a fertility specialist who talked to me on behalf of the Royal Australian and New Zealand College of Obstetricians and Gynaecologists (RANZCOG), said there was definitely a lack of awareness among GPs here and that some fertility specialists weren't giving it the consideration it deserves. I completely fluked that my specialist had had five other women with this thing in the last few years. He knew how to diagnose it and who to refer me to – my surgeon had operated on all of those women. I've heard of other specialists who have dealt with it too but none of the clinics I've called have confirmed that, or given me actual numbers. So my impression is that the guys who treated me are the go-to defect guys, in Auckland at least. I went overseas for the experts partly so that I wasn't dragging my own doctors into the story too much. Also what I was doing was reading all the medical literature and emailing the authors – I must have emailed dozens of specialists all over the world. Portugal, Canada, Japan, Korea, Spain. Poland. Mexico. Hungary. I suspect many of them couldn't read English, or thought I was a bit mad. (NZ has no research. Zero). It seems like in the States this thing is maybe getting more traction – not officially, but I think word is spreading about what it is, and about the private clinics who will treat it, and I think women are telling each other in infertility forums and things. It's harder for couples who already have a child to get public funding for fertility treatment. Would you be comfortable discussing the costs associated with diagnosing the condition and treating it? Sure. Money matters, right. We referred ourselves to Fertility Associates and we've paid for everything privately. And our story is really really common – so lots of women are only getting diagnosed after they've spent years and years and all this money on fertility treatments. Which they might not have even needed. Anyway. I've just gone through our bank records to work this out and we spent about $14,000 on infertility treatments before the diagnosis. The MRI and the surgery came to about $12,000 and that's with my surgery being really straightforward and quick and my surgeon making it as cheap for us as he could and using his own instruments and things. We had no health insurance. We made an ACC claim for treatment injury – so about the original c section causing the injury – but we couldn't wait to see whether it was approved or not, so we just went for it and we have our fingers crossed for a refund. I really hope I can set a precedent with ACC so that other women can get the treatment they need, fast. Time matters so much. It's just burned into you when you're going through this. How are you feeling now that you've had surgery (laparoscopy) to treat the scar defect? I recovered super fast, I just get the odd twinge, and the weird bleeding has stopped. So I'm optimistic. I feel like myself again. In my deep moments I feel like a huge, horrible hurt has been undone. But so impatient. We have to wait 'til October to try again. We could just try naturally but we're going to use one of the embryos – I have this funny feeling that we sort of owe one of them a chance. What are you hoping to achieve by sharing your story? I am very aware that hearing this stuff is scary for women. We had to strike a balance between informing women - and medical professionals! - of the risk, and making it really clear that while it's pretty common to have a defect in a C-section scar, and we think about one in three will cause abnormal bleeding and spotting, it's rare for them to cause infertility. I drove myself a bit mad trying to find evidence of a percentage figure but we don't have that data. So much about infertility is so complicated but these defects are simple and easy to fix. People just need to know to look for them. So right now I want women to feel empowered to challenge their doctors and push for the checks that might help them have a baby. They can do what one woman in my story did and print out the journal articles and shove them in their doctor's faces. I actually really hope they do. I want doctors to take these women seriously when they show up with unexplained infertility after a C-section – even if they don't have weird bleeding or pain, because defects can cause infertility without any other symptoms. Refer her, early. Please. I want the RANZCOG to get moving on drawing up their official guidelines for diagnosis and treatment, so that the District Health Boards might add a couple of lines to their brochures about defects. So when you leave hospital after a C-section you get a brochure to take home about what you can and can't do and what your next birth might be like, but there's nothing in there about being on the lookout for infertility and defects, and the symptoms to look out for, and there should be. All the medical experts I talked to support me on that. The College of Midwives didn't want to be involved in this story and that's fine, but I hope they take it on board and share it at antenatal groups and with the pregnant women they're seeing. For so many women their midwife is their wise one, the person they trust most through birth and all the crazy newborn bits, and I think it's really, really important that midwives share this information with them. I am absolutely haunted knowing that there will be women out there who have tried and tried and tried for years and never known what was wrong, and now they're too old. And it could've been fixed. They could have had another baby. I cry every time I think about that. More info on the condition here. * RANZCOG's Women's Health Committee member Dr Ian Page says there is not enough high-quality evidence for the college to develop guidelines around the defects. Sub-fertility specialists will be aware of the condition, he says. Women who have had a C-section and are struggling to conceive should see their GP, "as there are many other causes of difficulty in conceiving", he says.